Compose your christening bracelet together: Choose your model bracelet and you doopbedeltje. Cool her personal christening bracelet, sweet to the baptism itself and then a tangible reminder for later. Beautifully packaged, equally ready to give. Offer your communion bracelets together: choose communion charm and the bracelet that you like best. A truly personal and sweet gift for her communion, and a tangible reminder for later. Beautifully packaged, as ready to give. Beautifully symbolic communion bracelet. When tekstbedeltje in the middle hangs a glittering cross, symbolic of her communion. Sweet Sterling Silver Christening Bracelet made of genuine freshwater pearls, Swarovski crystals and silver rings. The small cross symbolizes her baptism, especially to wear and even better to be the "memento" keep afterwards. Make her christening bracelet entirely on the charm "Baptism 2015 'Baptism ♥. 'Love hopefully Faith'. If you order a baptism bracelet there we mount the charm at the clasp. Thus, the bracelet a beautiful memory of her baptism. Offer your bridesmaid bracelet together: choose your charm bracelet and what you like best. A truly personal and loving gift. Beautiful silver necklace faith. The cross has six sparkling cubic zirconia stones that sparkle beautifully. Elegant and stylish chain where they will have a long time. Make her bracelet extra special with a through-and-through silver. You can order the charm loose, allow to assemble a bracelet or necklace to a child. Thus the child is a real gem special reminders West for later! Luxury baptisms or communion bracelet to celebrate her faith feast. Magnificent bracelet made of shimmering ivory white pearls, sparkling crystal and silver buttons. At the bracelets hangs a sweet kruisj & small heart. Give a symbolic showpiece to celebrate and remember her palpable communion! Made of shimmering ivory pearls, sparkling crystal and silver buttons. Through-and-through silver, forever beautiful! These bracelets are my best sellers: Glistening AAA grade ivory white pearls, Swarovski crystals and sweet rings. Both bracelets hang with rhinestones occupy crosses. Symbolic gift for her baptism or communion. 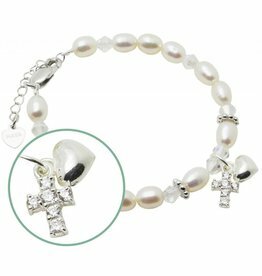 Compose your christening bracelets together: choose your baptism bracelet charms and what you like best. A sweet gift for mom & daughter to wear during the ceremony! Give a symbolic showpiece to celebrate and remember her baptism palpable! Made of ivory pearls, sparkling crystals and buttons.